Autism is a complex disorder that has a crosscutting impact on the people and public policy of our state. National data depict the explosive growth of ASD and data gathered in Tennessee have identified the critical mass that the system and our community is facing. We need new action to address the emergent needs of individuals, families and service providers affected by ASD. To address this need, the Autism Summit Team was formed. This team is a voluntary partnership of stakeholders across the public, private and nonprofit sectors. It is comprised of more than 65 individuals representing State Agencies, family-based or disability support and advocacy organizations, community service providers and universities as well as many family members and individuals on the autism spectrum. The Tennessee Autism Summit Team has been in place for five years and served as the planning and advisory council for a federally funded State Planning Grant from 2012-2014. The Summit Team’s goal has been to create a plan to build, improve and sustain a coordinated system of care for children and youth with Autism Spectrum Disorders/Developmental Disabilities. The system of care should be family–centered, based on best practices, and focus on quality improvement. The Summit Team addressed six identified areas of a comprehensive system of care: Early Identification; Service Coordination; Information for Families; Education; Healthcare; and Adulthood. They also considered the implications for data, training/workforce, and financing for the system. For each area, this report outlines the team’s findings, best practices, existing and emerging models, and recommendations for addressing gaps and needs. Many of these recommendations focus on indicators of a quality system of care. 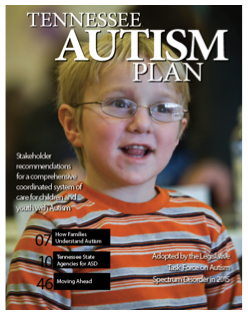 Tennessee has the building blocks for an effective system of care and the Autism Summit Team recommends that our state government establish an interagency team to coordinate them. Dedicating the financing, staff time and expertise to a formal team would move ahead the implementation process by leaps and bounds. This team would be positioned to lead the development of a comprehensive, coordinated system of care for children and youth with ASD. We must build our state’s capacity to support the new and the aging generation of individuals with ASD so that they may live quality, independent and productive lives alongside their peers. The Tennessee Autism Summit Team is committed to this effort and our strongest recommendation is that an interagency team in state government lead us on from here. We want to say a special thanks here to Autism Tennessee and Howard T. Ezell Photography for use of their fantastic photos in this publication. Thank you so much!